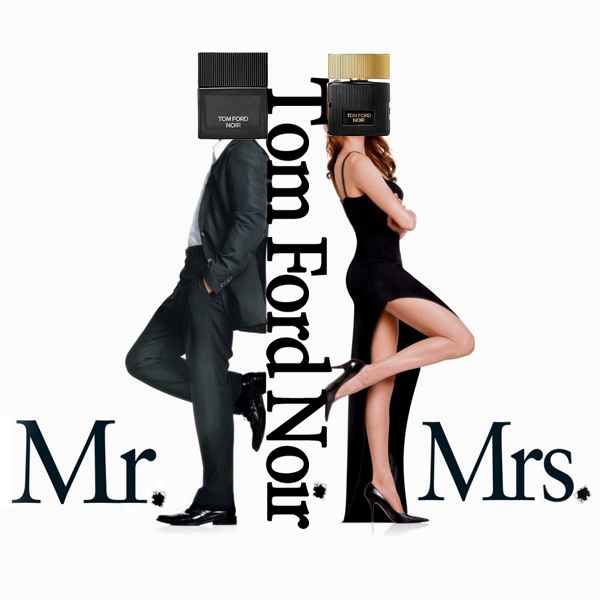 Tom Ford Noir released three years ago got mixed reviews (which perfume didn’t?) but since back then I was trying to test all new releases, to which I could get access, and I was a big fan of Tom Ford’s perfumes, I got a sample as soon as I saw the perfume on the counter. After that I don’t remember anything. Either I tried it then, didn’t write down my impressions and completely forgot about it or I just forgot to test it before putting the sample away. Tom Ford is still one of my favorite brands but after the recent disappointment with Velvet Orchid I somehow missed even the fact of one more perfume being released, which didn’t stop me from asking for a sample as soon as an SA cheerfully shared with me the news. I am glad I did. Since now I had both samples, I decided to make it up to the one I neglected. So first I tested TF Noir on my skin. Out of the cornucopia of notes mentioned on Fragrantica, I can smell some spices, citrus, vetiver, leather and vanilla. Then I persuaded my vSO to give it a try – just to check if it smelled better on him. It is a nice perfume; I have absolutely nothing bad to say about it and I welcome it as a great addition to the mainstream perfumes stable. Moreover, I would recommend it to “civilians” of both genders before most other modern offerings. Unfortunately, it’s so… unremarkable that I can’t imagine circumstances, under which I wouldn’t want my vSO to wear TF Noir instead of my other favorite Tom Ford’s perfumes – Tuscan Leather, Oud Wood or Tobacco Vanille. This entry was posted in Favorite Perfumes, Not a Review and tagged Tom Ford, Tom Ford Noir, Tom Ford Noir Pour Femme. Bookmark the permalink. :) Yeah, you could say it like that. Very nice, a bit like I feel with my tests this week, but of course they weren’t married but merely related by perfumer ;-) I liked your description from ‘I have nothing bad to say about it and I welcome it…’ I know that feeling so well. I suppose the men’s fragrances are still a lot more conservative than the female. From the standpoint of not being conservative Tom Ford Noir gets some points from me: it is less masculine then an average modern “pour homme” concoction. Off to read about your test impressions. Both these launches have completely passed me by – as so many new releases seem to do these days, so was pleased to catch up on this Mr and Mrs duo via your review, and am now intrigued about the Noir Femme one. I am a bit of a Tom Ford fan too, though the brand comes in for a fair amount of flak in the blogosphere. And I guess the fact that Noir is so ubiquitous as a perfume name doesn’t help – I stumbled upon my samples of Coco Noir and The White Company’s Noir last night, as it happens, during a massive reorg of my collection. At least this one wasn’t called Noir Oud Wood. And worse still, Noir Oud Wood pour Femme! The name was a definite turn of for me as well: in addition to it being too generic, I didn’t like Tom Ford’s Noir de Noir. But I’m glad that I decided to try it anyway. BTW, I really like TF’s Oud Wood on my vSO (though the name could have been more descriptive). Thank you, Suzanne. I enjoyed making that illustration. Partially – because I strongly disliked the original ad for NPF perfume (racoon eyes make-up has never seemed attractive to me). Once upon a time I liked Brad Pitt as an actor (Meet Joe Black made a long-lasting impression on me) but recently whenever I hear his name I immediately picture him in that strange Chanel No 5 ad. Would you believe I bought the 30 mL preview bottle blind and still have not tried it? I was afraid that if I ended up liking it, I may be stuck with 100 mLs so I jumped on it and ordered directly from Tom Ford online. I have since been rewarded with a Tom Ford email every 3-4 days, sometimes twice a day. I will wear it soon – the weather is just on the verge of turning to my favorite fall weather although I think we may still be set at warm next week. You’re impossible! :) I think you’ll like it. I was just recently thinking that I like Fall/Winter perfumes much more than summer ones and I’m glad that I’ll get to wear them soon. Thank you, Esperessence. TF Noir pour Femme is a safe choice for testing: even if you end up liking it, it won’t break the bank (unlike some others perfume in his Prive line ;) ). I tested it yesterday, Undina, and quite frankly, I quite liked it. If not for your review, I would not have tested it. Would be great for winter and Christmas time ! Yay! :) I like when that happens: it’s so easy to miss something you might like in that avalanche of new releases. I discovered at least several gems thanks to the blogs I read. Luckily, this one shouldn’t be hard to get to try. I think Nordstrom will carry it soon. Loved this post on these Tom Ford’s and agree with what Suzanne said about Brangelina as well. I do want to try the new perfume I just need to track it down….